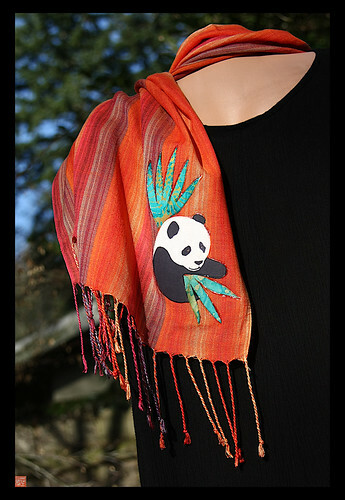 ONE OF A KIND HAND APPLIQUED BATIK SCARF AVAILABLE NOW …. 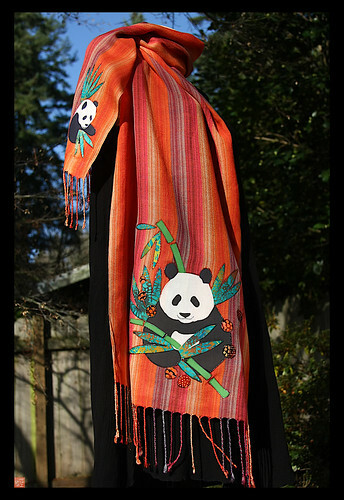 With leggings, a skirt, jeans, or slacks, or a winter coat this scarf looks equally impressive!! The heads will turn when you wear this beauty!! RASTA PANDA needs to snuggle and is available for adoption!!! Hey Sandy~ This looks like a Jamaican Sunset. Shall see one in two weeks. Whoppee!